Bavarian Cream. 1 quart cream half teacup cold water 2 teacups sugar, Half box Cox's gelatine. Soak the gelatine in the cold water a few minutes. 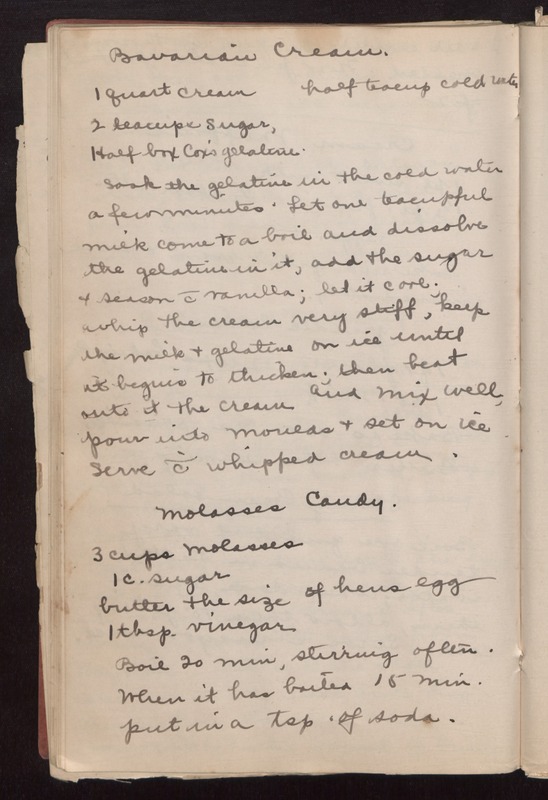 Let one teacupful milk come to a boil and dissolve the gelatine in it, add the sugar & season /c vanilla; let it cool; whip the cream very stiff, keep the milk & gelatine on ice until it begins to thicken; then beat into it the cream and mix well, pour into moulds & set on ice. Serve '/c whipped cream. Molasses Candy. 3 cups molasses 1 c. sugar butter the size of hens egg 1 tbsp. vinegar Boil 20 min. stirring often. When it has boiled 15 min. put in a tsp. of soda.